When the new owners of an old gate house took over the premises, they found this old John Tann Reliance Book Room Door (BRD) firmly closed and and with no keys to be found. They called safecracker to open the door. 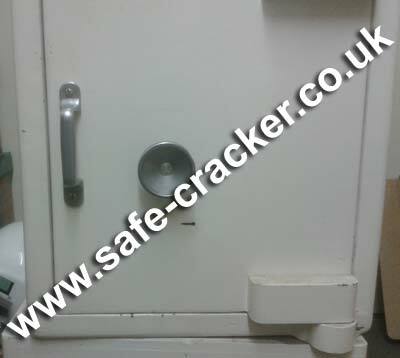 Safecracker attended and using a specialist safe engineer scope was able to identify the fitted lock as one of the Tann Guarded Lever locks. This design prevents picking the lock with a conventional lock pick. The other thing that safecracker was able to identify was that the lock was in fact open! 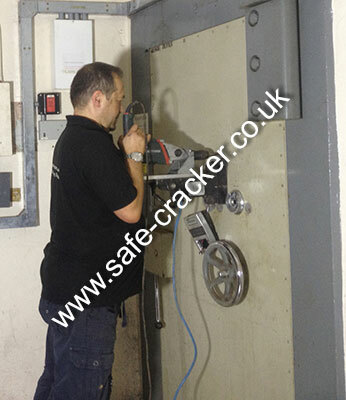 Safecracker was able to jack the door open. If you need a John Tann safe opening call safecracker. When the staff in the cash office a large department store in Brent Cross came in to work they could not open their John Tann Vault. They telephoned round trying to find someone who could assist eventually calling Safecracker. After a few questions and answers over the phone, safecracker was on route to the premises, arriving within the agreed hour. 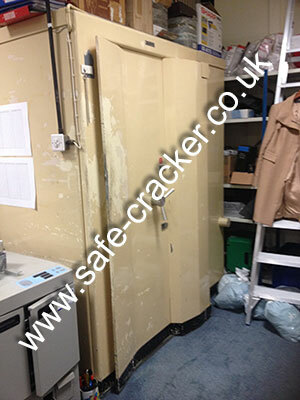 Safecracker then opened both locks on this vault allowing it to open and putting it back in to full service. 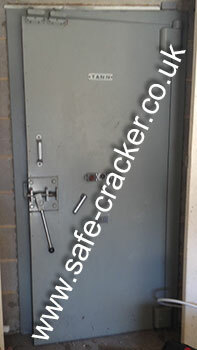 If you have a John Tann vault or safe which needs opening, you only need to make one call, and that is to Safecracker. When a famous bullion company moved out of their offices in Lambeth, they left most of the Vault, Strong Room and Book room doors locked. Safecracker got the contract to attend and open them. This is one of two John Tann Vault doors I quoted to open, but on opening the first, it gave access to a massive under ground vaulted complex from which I could get access to the rear of the second door. The job went so well I only invoiced for half of my original quote. If you need a John Tann Vault opened call safecracker. When a famous bullion company moved out of their offices in Lambeth, they left most of the Vault, Strong Room and Book room doors locked. Safecracker got the contract to attend and open them. I halved the quote for this door as I had originally quoted to open both locks. But on arrival, nobody had noticed that the top lock had the key still in it! which just left the bottom lock still to open. If you have a John Tann door to open, call safecracker. Tann Ministry - North London Prison - Lost Keys!! When one of the staff members at a famous north London prison did not show up for work and was in dispute with prison officials, they realised that a set of the prison keys were missing. If these were not quickly located it meant that all the locks in one part of the prison would have to be changed at a cost to the tax payer of £125,000. On receiving the phone call from prison staff safecracker dropped what we were doing and headed to the location. On opening the safe, staff were able to recover the missing keys from within it. 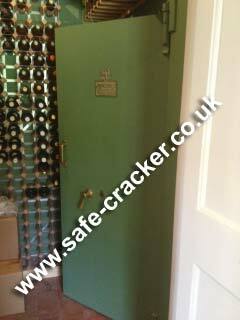 If you have a safe that needs to be urgently opened call safecracker. When the new owner of an ex-main post office started to renovate the building they took down a wall and found this locked Tann door behind it which no one knew about. They called safecracker. We attended and opened the door for them. 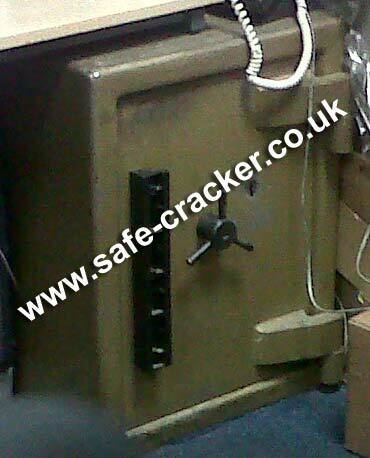 If you have a Tann or any other safe that needs opening call safecracker. When the staff at Ramsay's in Claridges Hotel where clearing up before their final service they realised that they could not find the key to this Tann Tenacity safe. They called safecracker. We attended and opened the safe for them. We don't know if it contained all of Gordon's secret recipes, but we do know that we remain undefeated in any safe opening. 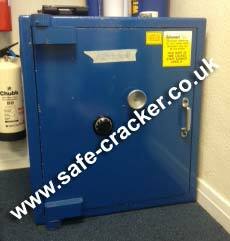 If you need a safe opening call safecracker. When the staff at this famous landmark in Holborn wanted to carry out a full inventory, they realised that nobody had entered this John Tann book room for over 50 years! They called safecracker. We attended and opened their John Tann book room for them. 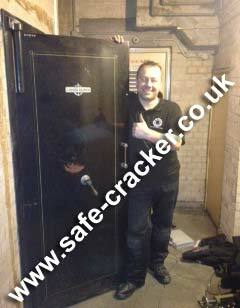 If you need a Tann safe or any other safe or book room door opened call safecracker. 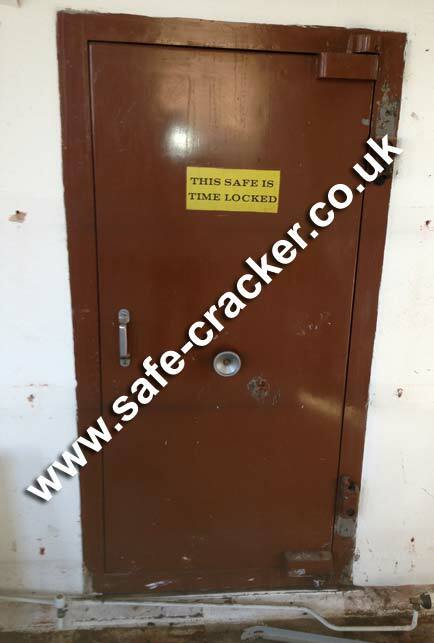 When the new owners of this large estate in Hertfordshire found this John Tann book room door and needed it opening they called safecracker. We attended and opened their John Tann book room door for them. 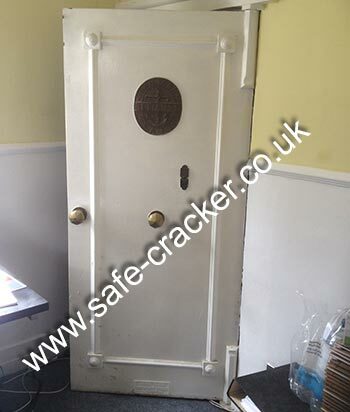 If you need a Tann safe or any other safe or book room door opened call safecracker.